Diversity is central to TechCrunch’s mission. We believe that everyone, regardless of background, should have access to the immense possibilities of the tech world. We also believe that a diversified workforce can only benefit technology businesses and society at large. In that spirit, TechCrunch’s Include program aims to use TechCrunch’s editorial, product, data and events platforms to encourage more diversity in tech. In keeping with our commitments in the core principles and mission for Include 2016, we assembled the following progress report on our initiatives, staff and workplace culture. The people who take the stage at TechCrunch’s events or appear in TechCrunch’s posts shape perceptions and possibilities in the tech world. With that in mind, we set a number of goals for our editorial coverage, both in posts and onstage. TechCrunch’s goals and performance are outlined below. Goal: Make sure that the process of choosing investors, judges and founders to appear onstage at TechCrunch Disrupt events and the Crunchies does not overlook those from underrepresented backgrounds. At our major events in 2016 — the CES awards in January, the Crunchies in February, TechCrunch Disrupt NY in May and TechCrunch Disrupt SF in September and TechCrunch Disrupt SF in December — we tracked the diversity of speakers, Startup Battlefield contestants and judges. The TechCrunch editorial team focused on bringing diversity to the stage in compelling ways in the course of building the show. For Startup Battlefield, TechCrunch’s startup competition, we approached more than 20 community groups and nonprofits in the Bay Area to reach underrepresented founders and encourage their participation in Battlefield. Our methodology for collecting data on our event participants varied. To date, we have tracked the gender and racial breakdown of our speakers, judges and Battlefield contestants through observed traits. In the summer of 2016, TechCrunch piloted an anonymous, self-reporting demographic survey to obtain more granular data on the applicants and participants in Battlefield. The data was not used in the selection of startups, but it provided more exact reporting of our Battlefield founders. Moving forward, we will be rolling out anonymous self-reporting surveys for all onstage participants in our events. Below is the data we have compiled thus far, from both self-reporting (Battlefield SF 2016) and observed traits. For this context, racially diverse consists of any ethnicity that is non-white. African American and Latino are specifically highlighted as they are among the most underrepresented communities in tech. We reached an all-time high of female speakers at Disrupt with 31 percent in New York but slid back to 23 percent in San Francisco only to push back up to 31% in London. Racial diversity among speakers was also strong in New York at 31 percent but fell back to 19 percent in San Francisco and once again up to 31% in London. The same pattern held for African-American / Latino speakers with 14 percent representation in New York and only 9 percent in SF. We need to establish a stronger and more consistent upward trend on all fronts. We have seen solid improvement in gender representation with our Battlefield judges, jumping from 33% (CES) to 36% (New York) and finally 47% percent (San Francisco) female judges. 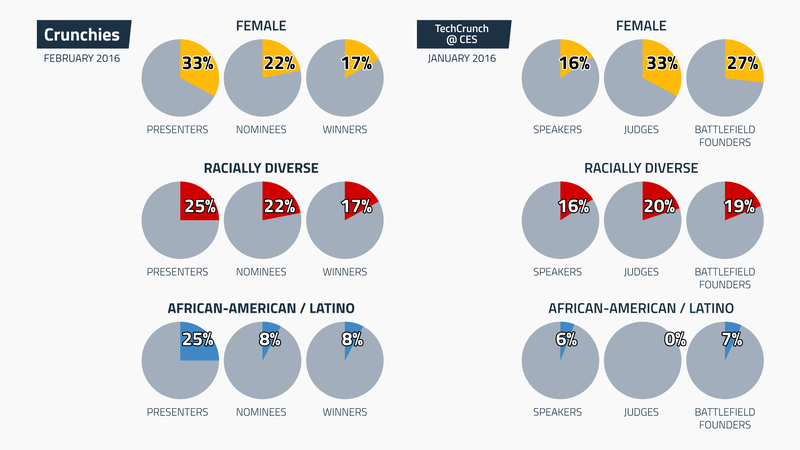 The judges are also our most racially diverse group, growing from 20 percent racially diverse and no African-American/Latino judges at CES to 43 percent racially diverse and 17 percent African-American/Latino at Disrupt SF 2016. 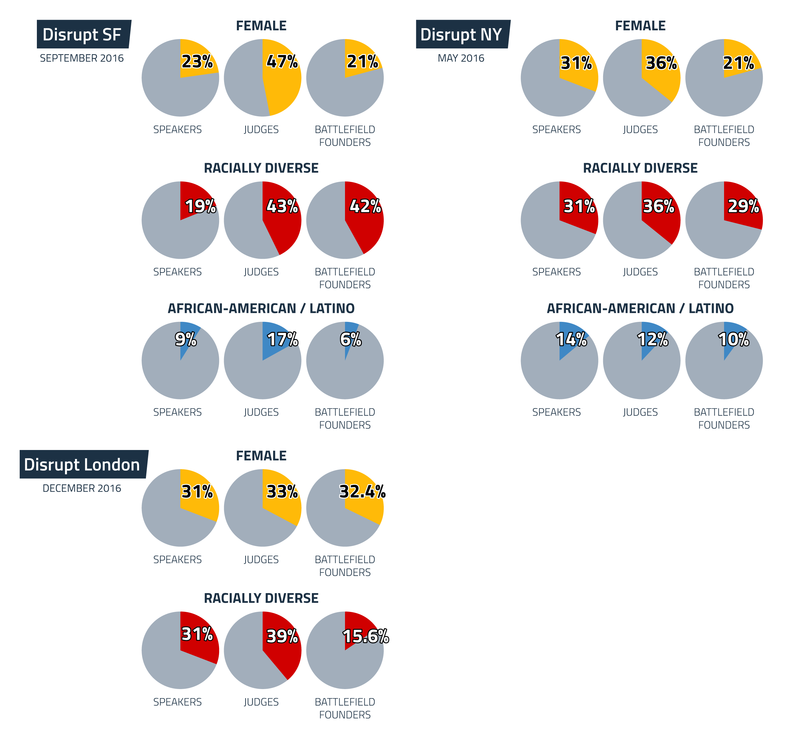 Disrupt London judges were 31% female and 39% racially diverse. We’re pleased with this movement in the right direction. For Battlefield founders, female founders consistently made up about 20 percent of each batch. The percent of racially diverse founders reached 42 percent in San Francisco, our highest ever, but the percentage of African-American / Latino founders declined from 10 percent to 6 percent from New York to San Francisco. For both of these communities, we need to do more outreach to increase applications to the Battlefield. The Crunchies happen only once a year, so we have a limited basis for comparison. Presenters were 33 percent women, 25 percent racially diverse and 25 percent African-American / Latino. We will improve on those numbers. Goal: Encourage writers to focus on diversity and inclusion issues in tech. Writers and contributors across TechCrunch and Crunch Network, including Megan Rose Dickey, Sarah Buhr, Lora Kolodny, Kim-Mai Cutler and Jon Shieber have continued and increased their examination of these topics. Here is a feed of related stories. Goal: Create a framework for evaluating coverage of diverse companies, founders and topics. This is a goal we have not yet met. We continue to have editorial discussions that raise these issues, but have not yet constructed a way to analyze and evaluate our coverage based on hard data. We’ll focus on getting this done in the year ahead. Goal: Provide free or heavily discounted admission to major TechCrunch events for schools or organizations working to promote computer science and careers in tech to people with limited access to those opportunities. Hackathon tickets promoted to over 20 separate groups working with underrepresented communities in tech. 80 percent discount on Disrupt tickets for students. 25 percent discount for underrepresented founders to showcase their companies in the Startup Alley. Five free Startup Alley tables provided to nonprofits selected from a pool of over 30 applicants through an open application process announced on the TC site. We also partnered with Brooklyn’s Red Hook Initiative (RHI) to offer roles for participants in their IT training program and promotion for their work, including a speaking role for the founder, Jill Eisenhard. TechCrunch launched a fundraising initiative onstage for RHI, which raised over $3,000 for the nonprofit. Hosted 60 middle and high school students from six different groups serving low-income communities and/or underrepresented backgrounds. Student groups were selected from an applicant pool of over 35 student groups through an open application process announced on the TC site. TechCrunch piloted the Battlefield Scholarship Fund to offset the costs of participating in the program. Tickets to Disrupt have been and will always be free for Battlefield participants. Five teams applied and received funding ranging from $1,500 to $5,000, which they used to cover airfare, housing and other associated costs. At Disrupt London, TechCrunch hosted The Girls Network, a group of 20 female youth who had the opportunity to explore Startup Alley, listen to our speakers on the main stage and have an intimate conversation with Supermodel and Elbi founder, Natalia Vodianova. We also supported some of the Battlefield companies with our scholarship fund. Goal: Develop concept of an Include “gala” to raise money and provide exposure for groups working on diversity in tech for some time in 2016. After much consideration and input from TC’s contacts at major tech companies, we decided not to pursue a fundraiser. We concluded that the effort was not likely to produce a meaningful return for the intended groups. Goal: Create a Diversity Award for the Crunchies. At the 9th Annual Crunchies, TechCrunch presented our first Include Diversity Award to Kimberly Bryant, the founder of Black Girls Code. Also nominated were: Erica Baker; Joelle Emerson, Paradigm; Laura Weidman Powers (runner-up), Code2040; and Kortney Ryan Ziegler, Trans*H4CK. Goal: Host Include Office Hours with partner VCs + a TechCrunch writer. The goal is to do approximately 12 Office Hours per year. Starting in October 2015, TechCrunch partnered with top VCs to provide feedback and mentorship to underrepresented founders. TechCrunch announced each Office Hour session — essentially an opportunity for a founder to meet face-to-face with seasoned investors — on the site and invited applications from founders from underrepresented groups. TechCrunch’s team selected 10 applicants to join the session and meet the VCs. This effort was originally focused on startups in the Bay Area and expanded to NYC in May of 2016. We are grateful for the generous participation of many VCs in New York and the Bay Area. Upcoming participants include Brooklyn Bridge Ventures, GE Ventures, Bain Capital Ventures, AngelPad, Samsung Ventures, Khosla, Flybridge, Trinity Ventures and Accel. Goal: Host a Women in Tech(Crunch) event at each Disrupt. The Women in Tech(Crunch) event has evolved to be an integral part of our Disrupt conferences. At Disrupt NY, we partnered with BBG Ventures to host 80 female founders, investors and TechCrunch staff. At Disrupt SF, we partnered with Greylock Partners to host more than 125 women in tech. And in London, we partnered with Accel Partners and Second Home to host over 100 women at our Women in (Tech)Crunch reception. TechCrunch set a number of goals related to the online presence of Include. Goal: Launch the Include “channel” on TechCrunch. The page beta.techcrunch.com/include was launched in early 2016. Goal: Tag relevant posts from TechCrunch’s diversity beat, as well as links to outside articles and data that are of interest. The “TechCrunch Coverage” and the “What We’re Reading” section of the site serve to make this content available. Goal: Update on the Include program and organizations collaborating with Include. Instead of an ongoing online update on the programs, TechCrunch has decided to let this bi-annual report serve as the update. Goal: Crowdsourced directory of organizations working to improve diversity in tech. The “Directory” feature provides a list of organizations, basic information about their activities and how to get in touch. We are eager to expand these listings. Please send suggestions to include@beta.techcrunch.com. Goal: Crowdsourced listings for events relevant to the Include mission. Events listing has not been integrated into the platform, but TechCrunch is committed to adding this feature to the site in early 2017. Goal: TechCrunch will report annually on the demographic makeup of its own staff. To document TechCrunch’s internal diversity, we distributed an anonymous survey in July this year. Staff involved with Include designed the survey and solicited comments prior to its distribution. The survey was open for one week and approximately 73 percent of staff responded. Staff and interns from across all departments, including admin, editorial, events, product, sales and social media, participated. The survey can be viewed at here and a breakdown of significant results is below. The survey found one person with a disability and no military veterans. With respect to gender representation, TechCrunch is ahead of typical tech companies. Compared to Internet-based media companies, however, the TechCrunch editorial staff is in the range of most other publications, with women holding about 27 percent of newsroom jobs. This is far from where we aim to be. 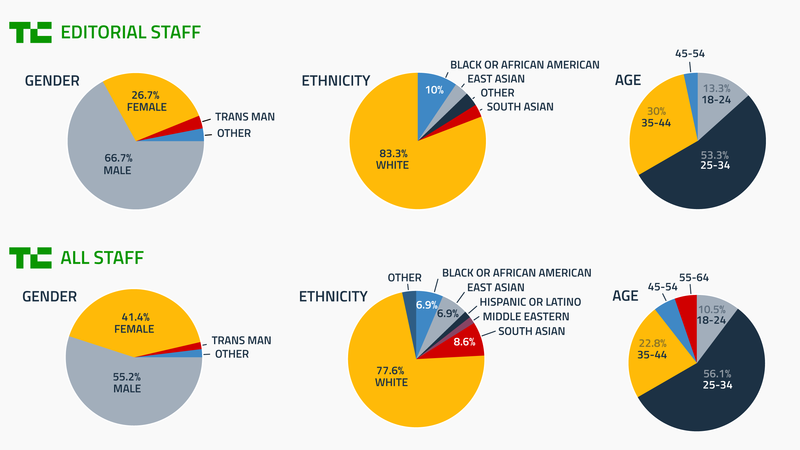 TechCrunch has the most work to do, however, in the area of racial diversity, where we are over 80 percent white on the editorial staff and 78 white percent across all company departments. TechCrunch will make it a priority in the year ahead to improve our recruiting and hiring in order to make our workplace more diverse. Goal: TechCrunch will hold periodic training sessions in subjects, such as management and hiring topics, relevant to the Include mission. TechCrunch does not yet have internal best practices documentation around hiring practices, but aims to do so by early 2017. Goal: TechCrunch will host quarterly meetings and dinners with its Include Advisory Board. Thus far in 2016, we have had only one meeting of the Include Advisory Board. Our original goal turned out to be too ambitious and we now aim to meet twice a year with our advisory board. The Advisory Board is comprised of Tracy Chou, Charles Hudson and Aarthi Ramamurthy. It’s fair to say that 2016 is the year the Include program really took hold across the full TechCrunch platform. As we noted in the Include mission statement, we aimed to try many things, double-down on what worked, discard what did not, remain transparent throughout and seek lots of feedback along the way. We will always consider Include a work in progress, and we welcome ideas and feedback. Feel free to reach out to include@beta.techcrunch.com with any comments, suggestions or ideas!